I purchased this in 9mm format. I seein another customers image that it came with rear stock, mine didn't, should it have? What pistol grip will fit on these? Pretty much the only part that feels cheap. Its poor quality plastic. It appears to be an AK grip. Magpul makes several as well as other companies. It is held on by a single screw hidden in the middle. The bottom cover just snaps off. I would get a cheap one at first till you or I can confirm for sure it is an AK grip. What base did you purchase? Weaver base does not fit on evanix Rex p ??? 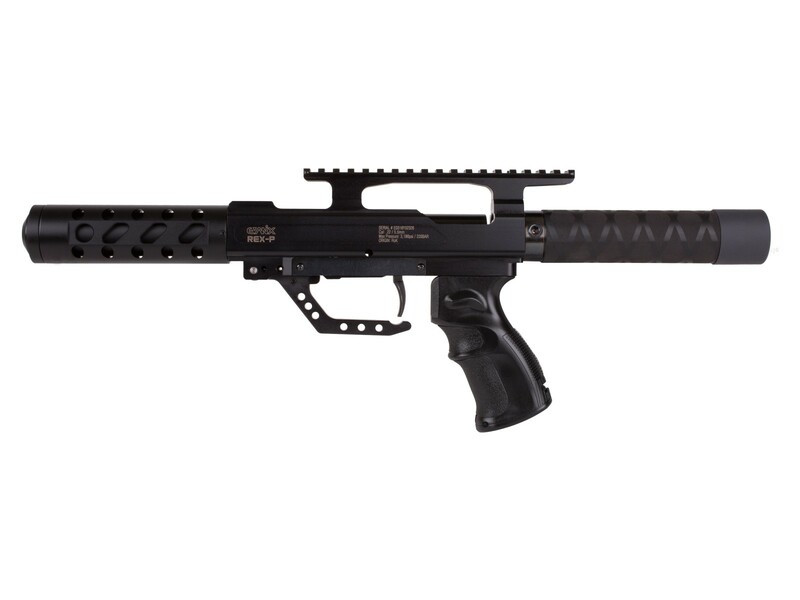 Will a Evanix rifle air tank fit into a Evanix Rex Pistol of the same rated caliber? Is the valve the same on the pistol tank (90cc) and the rifle tank (200cc) for the same caliber? In other words, if I put a .45 rifle tank on my .45 pistol, will I get higher fps/ftlbs? Tyler - I purchased the longer tank for my RexP - It did not work because there more travel in the larger tanks valve. In other words, the top hat on the rifle tank is taller/longer than the pistol tank. I do not know if this is a one off since I only have one of each tank, but I have contacted Pyramyd air to find out. Valve is the same for the same caliber. So your velocities on the gun would be the same with either tank. Will the .45 version ship to Canada? Most air guns are using lighter non lead pellets? Does this use real lead for testing and if so what pellet or at least the pellet weight? Do they make lead free pellets in the 45 size? Where can I get a new grip/handle for mine? I need a replacement handle anyone know where ? I bought a Hogue 70000 grip and it fits fine after I redrilled the hole in the grip to be straight instead of angled. the gun is designed around an AK style grip. I got mine today, and looks to be an AK grip. 9mm can the rifle air tank fit on pistol? The reason is because the tophat on the tank has to fit snugly in the barrel and have a good seal. So it would be rather hard to make a 45 fit a 9mm for obvious reasons. I just got mine today, fills with probe same as Hatsan gladius. My gladius fill probe worked and actually what I used. This will depend on your ammo of choice, but with most weights, you're looking at 2-3 shots above those energies. Do they sell exstra air tanks for this and how much ? They should be coming. We will know more when they come in. Due to the way this loads it would be very hard to use a clip. The round has to be seated by hand as just cocking does not push the round forward. Will this accept same pellets as Max Bullpup (9mm). Your mileage may vary. I just got my .45 Rex pistol today. I also ordered 411gr .45 Air Veturi rounds. those rounds are 20mm long and as such too long to load normally the only way to load them is to remove the air tank and slide them in through the back and into the barrel. The 9mm version may have clearance since the largest 9mm you can get are those polymer tipped rounds for Sheridan made for the Bulldog. What is the outside diameter of the shroud? The cosmetic part. Will it except a quad rail? What is the outside diameter of the tank with and without the foam covering? Covering is not foam, it is a very hard rubber and doubtful it could be easily removed. It is probably formed around the tank during manufacturing. thinking about sticking an AR buttstock on it? I think that last time I had one in my hands, I measured 3.5cm withouth the end cap. So it's around 0.6cm too wide for commercial spec. AR buttstocks (even more so for mil spec.) I'll measure again next week. It's a great idea! Better accuracy than the pistol, more shots per fill than the pistol. Nearly as compact as the pistol. Certainly more compact than the rifle with a shorter barrel time. You do give up 90 fps or so... seems like a pretty good trade to me. Just bought the new available Rifle Rex .22 Air Tank and it does not work. The picture of the new direct replacement spare air tank for the Rex-P .22 pistol does not look like it will work either. The design is different. Waiting on a reply for a full refund. Yes and yes. Not sure when spare tanks will be available for purchase just yet.